What are the disadvantages of carpet tiles? I work for FLOR and we have tons of colors, patterns and piles., which means we can do many many customizable things. It is super durable, sustainable and cleanable. Check us out at FLOR.com. We have stores in 21 locations across the country now. We would love to see you here!! what are these carpet tile colors - can you tell me where these tiles are from and the names of the colors? I think this color combo is fantastic! Orange? - What are the wall colors? Particularly the orange. Play Room - What is the off-white paint color? I also love the carpet color combo, but can't find everything on Flor.com. What are the tile names & colors? Start with a patterned tile that draws you, then grab some solid color choices from it. This image is a great example of the endless mix-and-match arrangements you can make with carpet tiles. If painting the walls in bright colors is not your thing, you can apply color blocking with a rug. This room is completely neutral and allows the colorful rug to stand out. Rug TilesIn addition to being bright and fun and providing endless opportunities for color and pattern combinations, Flor carpet tiles are easily installed (seriously, if I did it, anyone can), are relatively inexpensive and can be switched out should you slop your coffee on one. KidsPlaytime can be rough on carpets. Give these common children's stains a much-needed time-out.Crayon: Use the detergent solvent and blotting method to tackle this waxy stain. If the crayon is melted into the carpet, use the ice method to freeze the melted crayon, break it with a blunt object and then vacuum the rug clean.Paint or ink: Quickly blot a fresh paint stain until most of the paint has been removed. Apply rubbing alcohol to a cloth and blot; repeat until the stain is gone. Rinse with warm water.Glue: Apply an acetone nail polish remover, then blot. Repeat and rinse completely when the stain has been removed. Blood: Always use cold water when trying to remove a blood stain; warm water will cause the stain to penetrate further into the carpet, making removal even more difficult. Dab the white vinegar mixture (with cold water) on the stain and repeat until the stain is gone. Spot On Before treating a rug stain with a spot-removal product, test it out on an inconspicuous area first. The CRI says this is an important step, because some cleaning solutions can cause damage. Its advice: Apply several drops to the testing area and hold a white cloth on the wet area for 10 seconds. Next, check the carpet and the cloth for color transfer or visible damage to the rug. If you notice color coming off onto the cloth or discoloration on the rug, test another product. Once you have identified a safe cleaning solution, the CRI advises applying a small amount to the stain and letting it sit for about 10 minutes. Next, working from the outside edges of the stain inward, gently blot the spot. Repeat as needed. 5. Carpet TilesCarpet tiles have gained immense popularity as a flooring or area rug choice. They’re a resilient option because you can replace individual tiles that are worn or damaged. This is perfect for an unfortunate spill or an area damaged by heavy use. 3- I like how colorful the carpet is and how it is so great for the kids room. 2.I LOVE THIS BECAUSE THIS KIND OF COLORFUL CARPET IS SUITE AT KIDS ROOM OR PLAY ROOM, IT BRINGS MORE ENERGY. 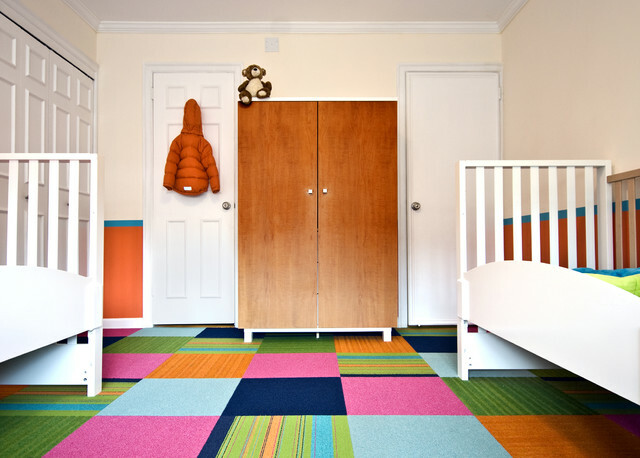 Inspiration 1 Fun use of brightly colored carpet tiles in kid's room.